I have again been reading the chapter of Proverbs that corresponds with the day of the month each morning in my quiet time. Yesterday I couldn't help but be amazed at how Proverbs 29:27 "The righteous detest the dishonest; the wicked detest the upright," is such an accurate picture of our world today. It seems to me those who desire to follow Jesus detest the dishonesty and immorality that is so widespread in the world today, and those who don't want to follow Him detest those who try to. The whole concept is becoming more and more pronounced in the past few years, I think. I have heard others say the dark is getting darker and the light is getting brighter and I believe they are right. Darkness hates light, so persecution is beginning to be much more evident--and I am sure will be more so--as people refuse to turn to the One who can deliver them out of darkness into the marvelous light. But we all know that light overcomes darkness. Even one small candle can do much to light up a room, so we must heed the words of Jesus in Matthew 5:16 to "let your light shine before others, that they may see your good deeds and glorify your Father in heaven." It is the only way those walking in darkness are going to see the goodness of the Lord and desire to know Him. It is time for those who love the Lord to shine brightly. Rick Joyner's Prophetic Bulletin: " The Great Tsunami"
This Word came today on Elijah List. I believe it is an accurate picture of what is about to happen. It is an encouraging word, but also a warning for those who do not know Jesus and rely on Him for their every need, so I am posting it for all who might not have the opportunity to see it. I know some are not familiar with the prophetic, but God says he does nothing without first revealing it to His prophets (Amos 3:7). Our job, with the help of the Holy Spirit, is to discern who are the real prophets, and then to pay attention to their words, so I present this for your discernment. In 1987 I had a two-and-a-half-day prophetic experience in which I was shown a panorama of coming events that I wrote about in my book titled, The Harvest. Most of what I saw coming has now taken place, but the biggest event of all, the harvest that was at the end of the age, has not. It is now approaching. Jesus said, "The harvest is the end of the age" (see Matthew 13:39). This will be the greatest ingathering of new Believers in history, greater than all the previous ones combined. In my vision, this came in two great waves. The first wave was the largest up until this time, but it was only the ingathering of those who were called to be the laborers in the coming even much greater one. This first wave began shortly after I was given this vision and lasted for almost twenty years. During that time more people came to Christ around the world than had come to Him in all of history up until that time. Some estimates were that an average of almost four hundred thousand people a day were coming to Christ during its peak. There were countries where people were being born again faster than they were being born. Hundreds of millions came to Christ in Africa, South and Central America, and Asia. Though this wave hardly seemed to touch North America and Europe, they provided many of the evangelists and workers for the other great revivals around the world, and their time is coming. I then saw a period of relative calm before the greatest of all moves of God began. We are near the end of that time and are about to be hit by a wave of revival like the earth has never seen before. 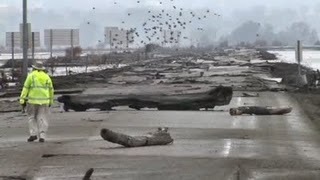 When a tsunami is traveling across the oceans, it is barely a discernable ripple in the water, but when it approaches land, it begins to rise fast, sometimes to a height of several hundred feet. In minutes, a calm sea can rise up and sweep away everything in its path. Even though it may seem that we are in a spiritual calm now, a spiritual tsunami is coming, and we must prepare for it. The biggest problem virtually every church will be facing is how to handle explosive growth. In the vision, I saw small churches of less than a hundred people adding a thousand new members a week at times. Of course, this happened on the Day of Pentecost, and then there were other days in which thousands came to Christ in a day. Even with a dozen apostles personally trained by the Lord, there was stress caused by this. Pressure points gave birth to new ministries such as the deacon. The infrastructure of church life that this produced is still the model that works, and we need to return to its effective simplicity to handle what is coming. I saw churches that grew so large that they started renting football and soccer stadiums in which to hold their services. At times, hundreds of thousands would gather in parks and huge outdoor meetings just to hear Bible teachers to pray and to worship. Not only were whole cities coming to Christ, but also entire nations were coming so that the state itself became like a large church. A few years ago I decided to watch the news for several hours a day for a week to determine what percentage of stories could be considered good news. During that time I did not see one good news story. They were all about problems, crises, disasters, and suffering. This was during the time of some of our greatest economic prosperity. Now it's worse. However, change is coming. When this next wave hits, the news around the world is going to be dominated by good news. We will see events like hundreds of thousands of people gathering spontaneously for prayer and worship, becoming the biggest news stories of the day. News teams will be following apostolic teams and evangelists like they do politicians and business leaders now. Much more is happening now than most are aware of, or that is making the news, but when the Lord "suddenly comes into His temple," it will be the news, and the whole world will be aware of it. There will be individual newscasts from secular networks that will cause more to come to Christ than Christian networks have in their entire existence. This is not to negate what has been accomplished by Christian networks but rather to stress the impact that this revival will have. We will go through a period when the news of the great things God is doing will crowd out just about all other news around the world. Both the Welsh and the Azusa Street Revivals made front-page news around the world repeatedly for nearly two years. That was just a foretaste, a seed being planted for what is to come. The coming move of God will in some ways be a composite of many of the great moves of the past, but in one basic way it will be different—this will not just be a move of God, but it will be God moving. This is not just semantics, because every true move of God is at least initiated by God, but He will bless many things He will not inhabit. His manifest presence will be so great in what is coming that people will not chase after individual truths, or acts of God, but they will be after the Lord Himself. He will be the conversation, not just what He does. This is a move that will lift up Jesus. When He is lifted up, all will be drawn to Him, not just to doctrines, projects, or missions, but to Him. Doctrine certainly has its place, and there is a great need for sound Biblical doctrine to be imparted to all new Believers, and for all other Believers to build stronger foundations on His truth. There is a need for projects and missions that are His will, but "the main thing is to keep the main thing the main thing," and the Main Thing is Jesus. The true apostolic Gospel was Jesus: "They preached Jesus and the resurrection from the dead." Jesus will again be the Message, and it will be what He is doing that gets the attention. What is coming is the return to the apostolic Gospel. The Way is a Person.Truth is a Person, and if we don't know that Person as our Life, then we don't really know the Way or the Truth either. He is coming to take His rightful place in His Church. When He does, the Church will be profoundly changed. When Jesus becomes our desire as He should be, the Church will become the ultimate society on the earth that multitudes will be streaming to. There is no greater adventure than the true Christian life, and there is nothing more boring than religion. Religion is about to be displaced by the true Christian life, and the great adventure will supplant institutional religion. We are coming to the most exciting times in history, but this is also a warning. If we are not prepared for what is coming, we will be victims of it. This coming worldwide revival will also be one of the biggest challenges ever. Moves of God are often referred to as waves in history because a wave is an accurate metaphor. For a surfer, there are few things as thrilling as catching "the big one." However, if you're casually strolling in the surf and the big one catches you by surprise, you will likely eat a lot of sand and drink a lot of salt water. Revivals can do the same thing to churches and ministries that are not prepared for them. Riding a wave is not possible unless you are positioned right to catch it. To catch a wave, you must discern where it is going to break. Then you must position yourself in the right place. Then you have to begin moving in the right direction when it comes. Though it may seem that everything is quiet right now, we need to be getting prepared for what is coming by getting into position and be ready to move in the right direction as it comes. The most important thing that we can do to get into the right position is to recover and strengthen our first love—Jesus. We all signed up for Him, not just good teachings, or a better way to live, though we do get those too. There is nothing on earth more contagious than a person who is getting closer to the Lord. Those "who have been with Jesus" are going to start standing out as never before. We only have true spiritual authority to the degree that we are abiding in the King, and the leaders of what is coming will be those who are the closest to the Lord. What is coming will be far too big for any human leadership or strategy to control. Only the Captain of the hosts can lead this one, and He will. It is not just hearing the words of the Lord as much as it is hearing the Word Himself.The main strategy for what is to come will be to know His voice and to obey Him. He will be giving personal direction to His people. This is why we are told in Acts 2:17-18 that "in the last days" when He pours out His Spirit, the result is dreams, visions, and prophecy upon the old and young, male and female, which obviously includes everyone. This is because we are going to need this kind of guidance for what is to come, and He is going to give it to us as He always has for those who would seek Him. The coming move of God will be the greatest challenge we've ever faced but also will be the greatest time of our lives. These are the times that even the prophets of old desired to see. The Lord has saved His best wine for last, and many who are reading this will witness the greatest move of God of all time. "Come to Me, all who are weary and heavy-laden, and I will give you rest. Take My yoke upon you, and learn from Me, for I am gentle and humble in heart, and you shall find rest for your souls. For My yoke is easy, and My burden is light." You do not put on a yoke to go to bed but rather to do work. However, there is no greater rest and refreshment for our souls that we could ever find than being yoked with the Lord in His work. There is no job or profession we could ever have in this life more fulfilling than doing what He created us to do before the foundation of the world. This will be life on a level more exciting and fulfilling than most have ever known. Even so, knowing and abiding in the rest of the Lord will be crucial for all during this time. As much work as there will be to do with so many coming to the faith, we must not fall tohuman striving. Striving is counterproductive in the work in the true work of the Kingdom. "But an hour is coming, and now is, when the true worshipers will worship the Father in spirit and truth; for such people the Father seeks to be His worshipers. God is spirit, and those who worship Him must worship in spirit and truth." The Apostle Paul said that if we are at home in the body, or in the natural, we are absent from the Lord (see II Corinthians 5:6-9). We should be more at home in the spiritual realm than we are the natural because the "new creation" is born of the Spirit. This too is going to become a reality in what is coming. Then extraordinary miracles become common, and even the "greater works," such as speaking to mountains and having them plucked up and moved, will be done to prove that the Word of God is true. The true Christian life is a supernatural life, and this will be a reality in what is coming. However, that we will be seeing such miracles also means that we will be living in times when we will need those miracles. Everyone will be in either continuous awe and wonder at the great things the Lord is doing, or in continuous terror at what is happening in the world. The Apostle Paul said in Acts 14:22, "Through many tribulations we must enter the Kingdom of God." This is true personally and for the whole world. In every trial there is a door to the Kingdom, and in the ultimate trial of the whole earth, the whole earth will enter the Kingdom. The good thing is that the tribulation will not last, but the Kingdom will. For those who are staying close to the Lord, they will hardly know that they are passing through tribulations. In a prophetic experience, I was once caught up and found myself standing in front of a radar screen on a warship, with the Lord Himself standing next to me. There was a blip on the screen coming straight at us, so I called for the ship to turn 90 degrees. The ship turned, but the blip on the screen remained right in front and coming closer. I called for the ship to turn again, with the same results. I then braced for the impact, but the blip went away and nothing happened. I then asked the Lord what had happened. He said the blip on the radar screen was the great time of trouble. He said that it was coming and there was no way to avoid it, but if we stayed close to Him, we wouldn't even feel it. For those who are walking in their purpose, even the great tribulation will be a minor event. There will be far more attention on what Christ is doing than on what the antichrist is doing. As we read in Isaiah 60, at the very time when darkness is covering the earth, and deep darkness the people, the Lord's glory will be rising on His people. Then, as we see in verse three, the nations will come to the glory. The light wins! We do need to know the devil's schemes, but true security comes from knowing what Christ is doing, and uniting with Him in His purposes. As we read in Daniel 2, at the same time all of the kingdoms of men are collapsing and becoming like dust, the Kingdom of God is growing, and it will keep growing until it fills the earth. Those who are obeying His command to seek first His Kingdom (see Matthew 6:33) will experience never-ending increase. Those who are seeking first the things of this world will experience increasing troubles. Every coming year this distinction will become more pronounced. It is time to put the Kingdom first, above anything else that we are pursuing. One of the most important things that we can do to be positioned to catch the wave that is coming is to come to know the gifts and ministries of the Spirit that we are called to walk in, and begin to walk in them. The Ephesians 4 mandate of all true New Testament ministry is to equip others to do the work of the ministry, not just do it ourselves. Those who do not obey this mandate will soon disappear from leadership in the church, and those who train and equip their people will be the future leaders of the Body of Christ. These are the ones who are not burying the talents they've been entrusted with but are investing and multiplying them. We cannot accomplish what we must in these times without every part of the Body doing its part. For the last five years I have been shown many difficulties and hardships that will be coming, and to date, they have proven to be accurate. Not many wanted to hear or believe what we had to say, and I have to admit that it has not been much fun having so many hard words. Even so, all of these trials have doors to the Kingdom that we must now walk through. Those who did hear the warning and prepared accordingly have done very well. The prepared will prosper in any situation. One of the most important preparations we can make for these times is simplicity of life. Gaining or losing natural resources is not nearly as important in these times as being in the right place, equipped for our purpose. To lose everything we own is not nearly as important compared to missing the greatest of all spiritual opportunities that is coming. The most valuable thing we can accomplish in this life is to hear those greatest of words on the Judgment Day: "Well done good and faithful servant" (see Matthew 25:23). There is not a human being who would not gladly trade all that they accomplished to hear those words on that day. This is also what we must live for now. Those who do will be the happiest of all people, and that joy will not go away forever. The meetings with Ian & Rosemary will be held on Sat. night, Sun. morning and Sun. night. They are open to anyone interested in being part of what God is doing here, anyone who wants to know more about praying for healing, all those who want to hear what God is doing in other parts of the world, or for anyone who needs prayer for healing. We invite you to come. If you're interested email me, and I will send you the times and directions to our meetings. Ian & Rosemary live in England, but minister all over the world. When Ian was here a few months ago we were amazed at the stories of healing he recounted and at the things he taught us. We are so excited and grateful that he is able to come back and that Rosemary is coming with him this time! We believe the fact that they are in the country and that their schedules were free at this time so that they could come here at this time is confirmation that God is up to something. I believe it will be a weekend to look back upon and say "look what the Lord has done!" I wouldn't miss it for anything! We attended the Terre Haute Symphony last night. The guest artist was Stephen Kim, a 15 year old violinist from California. He was incredible! The name of the concert was "Catch A Rising Star," and he definitely is! I have never heard such beautiful sounds coming from a violin before! But what I enjoyed even more was watching the musicians perform together. It is obvious that each one is gifted, but also that they have spent many hours practicing alone before coming together. As I watch them perform, I am always reminded of the body of Christ. The Bible says we are part of one Body, of which Christ is the head. Each part is gifted and needed for the effective functioning of the body. (See Romans 12 and 1 Corinthians 12.) That's the way it is in the symphony. Each person is part of the greater body, and each does his or her part to bring forth exquisite music together. Some play more than others. Some musical compositions are written to showcase specific instruments. I believe our life in the body of Christ is to be like that, too. The key, though, is the time spent alone with God before we're asked to play, cultivating a relationship with Him, becoming aware of the gifts He has given us and developing them for use when we come together in our meetings. He, as the Great Conductor, can then use us in any way He sees fit. And just as it is in the symphony, sometimes we will play only a small part in what is happening, sometimes our part is monumental, but the key is to let the Conductor bring out the best in whoever is playing at the time. It seems to me that traditional church services have evolved into spectator events where the worship leader and the pastor are the only two people using their gifts (with the exception of a few in the praise band, if there is one) while the rest of us watch and critique the job they're doing. They are expected to perform--to do all the work. That would be like expecting the conductor of the symphony to play all the music himself instead of orchestrating the musicians into playing the songs! I believe changes are about to be made in the way we do church. This Month's FAQ – What Are The Characteristics Of Strong Passwords? Question: I have to come up with new passwords on a regular basis and feel like I'm just guessing at what characters to use. I could use some advice. What are the characteristics of strong passwords? Answer: You're smart to be concerned about your passwords. Using automated programs that target thousands of computers simultaneously, hackers can quickly crack many simple passwords and break into online accounts. Once they sign in as you, they may change the password, locking you out of your own account. Passwords should be at least 12 characters. Researchers at the Georgia Tech Research Institute learned that eight-character passwords can be cracked in about two hours, but adding just four additional keystrokes to a password could raise that to a theoretical 17,000 years. Combine letters, numbers, and symbols. The greater variety of characters in your password, the harder it is to crack. Choose from all the symbols on the keyboard, not just letters and numbers; consider using symbols such as &, >, # or @. Avoid sequences or repeated characters. Passwords such as "12345678" or "222222" are weak passwords. Don't use dictionary words. Hackers use sophisticated tools that can rapidly guess passwords based on words in multiple dictionaries, including words spelled backwards, common misspellings, and substitutions. Use a sentence as the starting point. While complicated passwords are safer, they're also harder to remember. To make it easier, think of a memorable sentence, take the first letter of each word, mix up lowercase and uppercase, and replace some letters with numbers and symbols. Once you've created a new password, find out how strong it is by visiting Microsoft's Password Checker at microsoft.com/protect/yourself/password/checker.mspx. It will instantly rate your password from Weak to Best. If yours doesn't rate well, it's back to the drawing board. Keep testing new passwords until you find one that rates highly. I thought this was an interesting idea. Some people are very creative! I am still wondering how they installed plumbing without a drain, but that isn't mentioned. Maybe there was a drain in the garage already. Otherwise it seems impossible to me. A peculiar thing happens on my Recipes page. Whenever I post a new recipe the space between the introduction and the first category widens. I sent in a request for information on what to do about that. I was told to look at the HTML code and delete some of the code. Of course, it is all a big puzzle to me. I delete a few things that seem to be repetitious almost every time I post a new recipe, but finally it comes to the point that I decide to repost the whole page, which I have done today. Since I was reposting it seemed good to add some more recipes and to rearrange some things on the Page, too. You will find I have moved a couple of recipes to other sections, and renamed the "Desserts" section "Sweets". Since the sections are in alphabetical order that moved it to the bottom of the Page. I had already added Dorothy's Heath Bar Candy several weeks ago in the Miscellaneous section. But since I have several more candy recipes that we make at Christmastime to post, I decided to call everything Sweets and move the Heath Bar recipe there. I also move the Best Steak Marinade in Existence to the Miscellaneous section. Hopefully, I haven't caused any confusion, but instead have made it easier to find your favorites. If any of you know how to edit HTML code, I would be glad to know how to keep the spaces from expanding in the beginning of the Recipes Page. It certainly would save me a lot of time! Today was the third meeting of our new church. We actually hesitate to call it a church because it does not look like a typical church. But since we do not yet have a name, it is difficult to write about it without calling it a church. (If any of you reading this has a suggestion for a name, we would love to hear it.) For the time being, we are meeting in our home with the express purpose to let Jesus be the head of us, His Body. Our desire is to glorify Him and to know Him. Our goal is to be His disciples--doing what He said to do and teaching others to do the same. We are asking Him, through the Holy Spirit, to direct us into discovering what that will look like. Our meeting this morning was a sweet encounter of His Presence. Even though we do not have any musicians in the group we worshipped Him through praise CDs. We also had an extended time of prayer, not only for direction for our group, but for those in our government--particularly our President--to understand the importance of supporting Israel, and for revival for our country and specifically, our community. We also believe part of the good news of the Gospel is that Jesus paid the price for our healing, and therefore we are to "lay hands on the sick and they will recover," so prayer for healing was also offered and important. I discovered some wonderful free resources for discipleship here on the internet. We have begun to use the Discipleship Journal provided on that sight to help us focus together on one attribute of Jesus each week. This was an excellent springboard for discussion today in the group, each sharing his/her insights and experiences related to "perseverance". Because we feel prayer is the only way we are going to hear what God is saying to us, we are also meeting on Wednesday nights at 7:00 to pray. If you know anyone interested in being a part of the new thing God is doing here in this community, please let them know about it . Everyone is welcome to come explore with us how we can be a part of bringing "the Kingdom to [our part of the] earth, as it is in Heaven." It is an adventure! Our daughter and our two youngest grandsons arrived last night from Nebraska after a long drive here (12 hours). It usually takes about 10 hours to drive from their house, but Interstate 29 between Omaha and St. Joseph, Missouri is closed and looks as if it will be indefinitely. (It is also closed north of Omaha for several miles.) 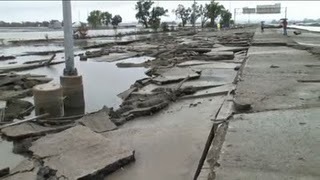 Here are a couple of pictures I found on the Internet of the damages to the Interstate. Until I saw these, I had no idea of the damage a flood could inflict on roads. This section had been underwater for awhile. The engineers have said they don't know when work can begin on I-29 because they have to wait for the roadbed to dry out--which could take months--before the foundation for the road can be laid. It looks as if it is going to be a long drive to and from visits with Jess' family for several years, doesn't it? This has been a stressful year for farmers! What a stressful year for farmers! Springtime was so wet that it looked like for awhile they weren't even going to be able to plant the fields. They have to be planted early enough to allow them to mature before the first frost. Mid to late April into early May is the optimum planting time. This year most of the corn was planted in June, and then just as they finished planting the rains virtually stopped. Those in the know figure a percentage drop in yields based on later planting dates. We have had over 2 months of extremely dry weather with only a few showers scattered over that time and temperatures sometimes in the high 90's. Needless to say, there was much concern voiced by every farmer I know about the crops' ability to "hang on." The jury is still out on what the yields will be like. But now a new problem has arisen. 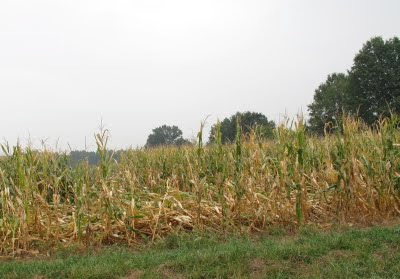 The moistureless corn has no strength and is falling down in the fields before it is dry enough to harvest. This certainly hasn't been a summer to enjoy. Don't you wonder why anyone would choose to be a farmer? Have you ever let your fear make a decision for you? Have you ever stayed home, not gone on vacation, not flown on a plane or not attended an event in a stadium, or mall, because of the news reports of possibly impending disaster--terrorist attacks, earthquakes, tsunamis, hurricanes, crime rate, etc? I have. There have been many tributes broadcast lately in the news to those who survived, and to those who gave their lives in the terrorist attacks on our country on 9-11-01. I am inspired by their testimonies, but the thought of what they went through also creates fear in me if I let myself dwell on it. I have to stop my thoughts from descending into fear, and instead remind myself of Psalm 91:11. "For He will give His angels charge concerning you, to guard you in all your ways." Now that is a wonderful promise! If I truly believe it I will not fear going anywhere, or doing anything. How can I fear when angels are watching over me to protect me? Isn't it interesting to note the number of the chapter and verse where this if found? It seems God's antidote to the fear of 9-11-01 is found in 91:11. The Psalm begins with, "Those who go to God Most High for safety will be protected by the Almighty. 2 I will say to the Lord, "You are my place of safety and protection. You are my God and I trust you." So there is a prerequisite. I have to go to Him--to put my life in His hands and to trust Him. When I do, He reassures me that He has sent His angels to watch over and protect me. How can I fear when myriads of angels (Hebrews 12:22) are at His disposal to keep me safe? What a great promise for us in these times when frightening news seems ever to be in the headlines! Please, Lord, help me always to turn to You and to trust Your word that you have angels protecting me. I truly do not have anything to fear. I received this devotional from Joseph Prince Ministries last week, but I am just now getting around to posting it. Since we often have a misguided view of God I think it helps us see Him in a different light. Even though, in theory we know He is our heavenly father, sometimes we don't follow through to logically understand what that means. I like the way Joseph Prince explains that God is a good Father. He loves us and gives only good gifts to His children--just as any good father would do. Daddy drives his car over his little girl’s legs. You can hear the sound of bones being crushed and the poor girl screaming in pain! You are probably shaking your head in horror by now, wondering which sick father would do that. Yet, there are many Christians who believe that our heavenly Father does the same thing. They say that He gives people sicknesses, accidents, earthquakes and death to teach them lessons. But Jesus said, “If you have seen Me, you have seen the Father.” Jesus is the nature of God in action. Throughout the Gospels, we see Jesus or God going about healing the sick. If God wants some people sick, then there should be at least one incident in the Gospels where you see Jesus saying, “Behold, your complexion is too lovely, receive leprosy,” or “Blindness is good for you. Remain blind.” But no, never once! In fact, Jesus “went about doing good and healing all who were oppressed by the devil”. (Acts 10:38) That’s the heart of God. As a father, if your child is sick and in pain, your heart just wants him well. How much more your heavenly Father! My friend, God does not give your child a sickness to teach both of you some lesson or to glorify Himself. To think so is to talk out of a warped mind bound by religion! And Christianity is not a religion. It is a loving relationship with your Father in heaven. A few years ago I started a wonderful (at least for me) tradition with our grandchildren. For their birthday I/we give them a card with money in it, and then I make a date to take them to lunch, or dinner at the restaurant of their choice. After eating we go shopping to spend the birthday money on anything they want. Of course they can choose to save all, or part of the money, too. It is great to have one-on-one time with them to get to know them better and to hear what they are interested in. I wish I had started this tradition earlier. I've missed out on enjoying this time with our two oldest grandsons. Their birthdays are in August and September and are now so busy with football practice that lunch with Grandma isn't too appealing. I hope I will be able to continue it with our two youngest grandsons even though they live in Nebraska. Yesterday Sydney turned 10, so today was her day! She invited Granddad to come along with us because her favorite restaurant is the Tokyo Grill, and she knows he enjoys the food there much more than I do. Since we are eating mainly fruits and vegetables for awhile though, I appreciated her choice. Afterwards Sydney thought she would like to spend some of her money on earrings because she recently got her ears pierced so we went to the Mall. She found a special for "buy 2 get 1 free" so she came away with 3 pairs of earrings and money left. She thought the other thing she would like to look for was a rabbit. She assured us her dad had said she could have one if she would be responsible to take care of it, but I thought we should call to make sure he would not object. He said it would be OK because they already have a rabbit hutch, but she would have to get it ready. She didn't think that would be a problem, so we went to Rural King and found this cute little guy. As Syd said, he is adorable! I knew you would think so, too, so I took his picture to add to the blog so you could see him. Sydney's brother's birthday is in October so I wonder where he will want to go? 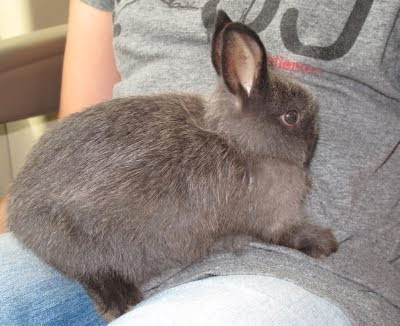 Will he want a mate for Sydney's rabbit, a video game, or some new toy I haven't heard of? Whatever it is it will be fun to spend the time with him. Hopefully, we will be able to see one of Parker's games soon, too. 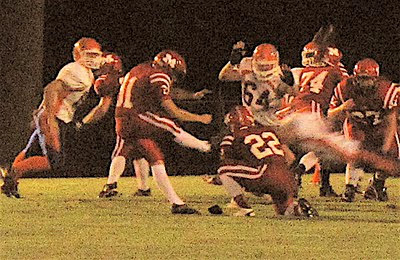 He is a freshman this year and plays on the Junior Varsity team. Parker is our avid Nebraska Cornhusker football fan (along with his Mom), so I know he is pleased to wear the red Marshall uniform. Obviously the deer are not too frightened of us if they can stop to feed their young as they're browsing on my plants! Can you tell there are twin fawns here? This article written by Ben Stein, is a very sobering account of our blindness in electing a President who not only does not love this country, but is intent on destroying it. I pray we will WAKE UP before it is too late. I believe the 2012 elections will decide the fate of America. If sanity is not voted back in, and this insanity is allowed to continue four more years, it will be the end of America as we know it. Our freedoms will be totally gone and we will be a socialist nation just as many of our leaders have planned. Please pray and vote. Consider running for office or helping in the campaign of someone who is determined to make laws based on the Constitution. Inform your neighbors--do your part in any way you can to restore the values America was founded upon. If we don't come together now and act, it will be too late. We have become very poor stewards of the great vision, freedom, and resources God gave us through the Founding Fathers--that which our men in the military have given their lives to protect. We have sat back and expected our leaders to lead with our best interests in mind, but it has become apparent that is not their intention. Let us understand, repent, pray for Godly leaders to arise, and begin to see that we all have a part in restoring the foundations upon which America was built. The American people in their unimaginable kindness and trust voted for a pig in a poke in 2008. They wanted so much to believe Barack Obama was somehow better and different from other ultra-leftists that they simply took him on faith. They ignored his anti-white writings in his books. They ignored his quiet acceptance of hysterical anti-American diatribes by his minister, Jeremiah Wright. They ignored his refusal to explain years at a time of his life as a student. They ignored his ultra-left record as a "community organizer," Illinois state legislator, and Senator. The American people ignored his total zero of an academic record as a student and teacher, his complete lack of scholarship when he was being touted as a scholar. Now, the American people are starting to wake up to the truth. Barack Obama is a super likeable super leftist, and not a fan of this country. The American people have already awakened to the truth that the stimulus bill -- a great idea in theory -- was really an immense bribe to Democrat interest groups, and in no way helped all Americans. The American people already know that Mr. Obama's plan to lower health costs while expanding coverage and bureaucracy is a myth, a promise of something that never was and never can be -- "a bureaucracy lowering costs in a free society." Either the costs go up or the free society goes away... an historical truth. These are perilous times. Mrs. Hillary Clinton, our Secretary of State, has given Iran the go-ahead to have nuclear weapons, an unqualified betrayal of the nation. Now, we face a devastating loss of freedom at home in health care. It will be joined by controls on our lives to "protect us" from global warming, itself largely a fraud, if believed to be caused by man. She has also signed on to a Small Firearms Treaty at the U.N. This is a back door gun control move. This is approved by the Senate and a 2nd Amendment majority doesn't exist in the Senate now. It will supersede all U.S. Law and the 2nd Amendment. All citizen possession will be eliminated through confiscation. Just Like Great Britain and Australia . Mr. Obama knows Americans are getting wise and will stop him if he delays at all in taking away our freedoms. There is his urgency and our opportunity. Once freedom is lost, America is lost. Wake up, beloved America . I thought this was cute and very true and that dog lover's could especially relate, so I'm posting it here for Country Guy and our children. Today was our first meeting of the new adventure God has been calling us to, and it was wonderful! Ken & Erin, who have lived in Afghanistan the past 4 years, came to share about their life there. Ken led us in worship before showing us an excellent video of the International School where he is assistant principal in Kabul. Here is another email I received recently and thought it was worthy of posting. I agree totally with this person. I am anticipating, and eager to see, the resurrection and return of the America that was founded on strong moral principles and freedom for all. Please continue to pray with me for revival for this nation. Barack Obama is the best thing that has happened to America in the last 100 years. Truly, he is the savior of America 's future. Despite the fact that he has some of the lowest approval ratings among recent presidents, history will see Barack Obama as the source of America 's resurrection. Barack Obama has plunged the country into levels of debt that we could not have previously imagined; his efforts to nationalize health care have been met with fierce resistance nationwide; TARP bailouts and stimulus spending have shown little positive effect on the national economy; unemployment is unacceptably high and looks to remain that way for most of a decade; legacy entitlement programs have ballooned to unsustainable levels, and there is a seething anger in the populace. That's why Barack Obama is such a good thing for America . Here's why. Obama is the symbol of a creeping liberalism that has infected our society like a cancer for the last 100 years. Just as Hitler is the face of fascism, Obama will go down in history as the face of unchecked liberalism. The cancer metastasized to the point where it could no longer be ignored. Average Americans who have quietly gone about their lives, earning a paycheck, contributing to their favorite charities, going to high school football games on Friday night, spending their weekends at the beach or on hunting trips - they've gotten off the fence. They've woken up. There is a level of political activism in this country that we haven't seen since the American Revolution, and Barack Obama has been the catalyst that has sparked a restructuring of the American political and social consciousness. Think of the crap we've slowly learned to tolerate over the past 50 years as liberalism sought to re-structure the America that was the symbol of freedom and liberty to all the people of the world. Immigration laws were ignored on the basis of compassion. Welfare policies encouraged irresponsibility, the fracturing of families, and a cycle of generations of dependency. Debt was regarded as a tonic to lubricate the economy. Our children left school having been taught that they are exceptional and special, while great numbers of them cannot perform basic functions of mathematics and literacy. Legislators decided that people could not be trusted to defend their own homes, and stripped citizens of their rights to own firearms. Productive members of society have been penalized with a heavy burden of taxes in order to support legions of do-nothings who loll around, reveling in their addictions, obesity, indolence, ignorance and "disabilities." Criminals have been arrested and re-arrested, coddled and set free to pillage the citizenry yet again. Lawyers routinely extort fortunes from doctors, contractors and business people with dubious torts. We slowly learned to tolerate these outrages, shaking our heads in disbelief, and we went on with our lives. But Barack Obama has ripped the lid off a seething cauldron of dissatisfaction and unrest. A former Communist is given a paid government position in the White House as an advisor to the president. Auto companies are taken over by the government, and the auto workers' union - whose contracts are completely insupportable in any economic sense - is rewarded with a stake in the company. Government bails out Wall Street investment bankers and insurance companies, who pay their executives outrageous bonuses as thanks for the public support. Terrorists are read their Miranda rights and given free lawyers. And, despite overwhelming public disapproval, Barack Obama has pushed forward with a health care plan that would re-structure one-sixth of the American economy. Literally millions of Americans have had enough. They're organizing, they're studying the Constitution and the Federalist Papers, they're reading history and case law, they're showing up at rallies and meetings, and a slew of conservative candidates are throwing their hats into the ring. Is there a revolution brewing? Yes, in the sense that there is a keen awareness that our priorities and sensibilities must be radically re-structured. Will it be a violent revolution? No. It will be done through the interpretation of the original document that has guided us for 220 "FANTASTIC" years--- the Constitution. Just as the pendulum swung to embrace political correctness and liberalism, there will be a backlash, a complete repudiation of a hundred years of nonsense. A hundred years from now, history will perceive the year 2010 as the time when America got back on the right track. And for that, we can thank Barack Hussein Obama. I just got an email from our son's friend, Ken, whose family will be visiting with Greg & Ashley this weekend. Since we are having our first meeting of the new adventure God is calling us to this Sunday at our house, I had emailed him yesterday to see if he & Erin would like to share with us about their life in Afghanistan. They have lived there several years with their 4 young children. They live in Kabul where Ken teaches at the International School and Erin has started a dance studio. He said they would love to talk with us and that they have a "cool DVD" they would like to share, too. He also said he would be glad to lead worship. We are blessed! If you know anyone who would be interested, this is a great opportunity to hear first hand about life in Afghanistan, and to meet 2 very special people--not to mention a great opportunity to come be part of what God is doing in this community. It seems as if the adventure has begun. I am very excited! We are becoming desperate for rain. The soybeans in the field along our lane are beginning to die in some places. Some of my plants, shrubs and trees looked so bad when we returned from NE that I am not sure they will survive even though I have been watering them. Needless to say, we are praying for rain! As I awoke this morning I realized that I must have been praying for rain in my sleep because that was my first thought as I opened my eyes. It seemed the still, small voice of the Lord said to me, "When you pray for my dry and thirsty people as fervently as you are praying for the dry and thirsty land there will be revival." I realized as I heard this that I have not been as concerned about what is on His heart as I have about what is on mine. He said His Will is that none should perish. I want to do His Will and that obviously is to do all I can to see that as many people as possible will hear of His love and His goodness so they will turn to Him and not perish. Forgive me, Lord. Help me to remember your parched, thirsty people and the wonderful opportunity you give me to bring your living water to them through prayer and through my actions. Please don't let me forget. Welcome! And thanks for stopping by! I pray that you will be blessed with shalom which includes peace, completeness, soundness, welfare, safety, health, prosperity, tranquility, contentment, friendship with others and friendship with God. While you're here, I hope you will discover a thought-provoking idea, a little inspiration and encouragement to brighten your day, new ways to make your life less complicated and a lot more fun, or even a new recipe. Always remember that God loves you and has great plans for your life (See Jeremiah 29:11). If you have time, I would love to hear your comments and suggestions. Please come back anytime. What has happened to our world!! Translate---A fun, helpful tool that translates this blog into 80 different languages. And what is God’s “living message”? It is the revelation of faith for salvation, which is the message that we preach. For if you publicly declare with your mouth that Jesus is Lord and believe in your heart that God raised him from the dead, you will experience salvation. The heart that believes in him receives the gift of the righteousness of God—and then the mouth gives thanks to salvation. My name is Brenda. I love Jesus and it's my hope and desire that if you don't already, you will come to love Him, too. He is altogether lovely and always good! He loves you more than you could imagine, and He has great plans for your life. Just ask Him. After 30+ years of living in Omaha, Nebraska, Country Guy and I returned to our roots in Illinois where we built a house in the woods on land once owned by Country Guy's great grandfather. We added a barn, a chicken house complete with chickens, and fenced pasture for our 5 beautiful quarter horses. We enjoy sharing these blessings with our family, friends, and guests who visit us from all over the world. Our immediate family includes 3 wonderful children and their spouses, and 7 equally wonderful grandchildren. I started this blog as a place to keep and to share my favorite things. In the process of discovering the potential of blogging I've also found it to be a great way to get the word out about news & ideas that are unpopular in today's media. I pray that you, too, will find treasures here to keep, or share with others, and ideas to stimulate your thinking. Nothing would please me more.